How do I check my activity data? 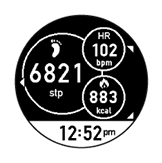 You can check your data on the watch or in the Epson View app on your smartphone. See below. 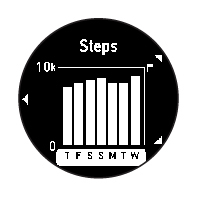 You can view the activity data you have collected on your watch while your activity is in progress or view a 7-day activity chart for the previous week. Press the Up or Down button to view each available activity data screen. When viewing the Daily Activity screen, press and hold the Back button for at least 2 seconds to return to the Time screen. When viewing the 7-day activity chart, press the Back button to return to the Daily Activity screen. Then press and hold the Back button for at least 2 seconds to return to the Time screen. You can review the activity data you have collected using the Epson View app on your smartphone. You can view activity data while your activity is in progress or view a 7-day activity chart for the previous week. Note: For information on using the Epson View app, see the online help. Published: Dec 1, 2017 Was this helpful​? Thank you for the feedback!